�����In January 2002, Heritage Auctions sold an 1856 O $20 Gold certified by NGC as a MS63 Specimen strike; it was the only one known in this grade. The coin brought $310,500. The timing of this sale was not the greatest choice, as the market had been headed downward for at least a year. This coin has since been sold at least two more times with the last known sale, again by Heritage Auctions, at Long Beach on May 2009 for $1,437,500. It is currently in a PCGS holder and includes the CAC sticker. �����As of February 2005, the FMV for the 1856 O in MS63 was $585,000 where it stayed until February 2006 when it jumped to $845,000. 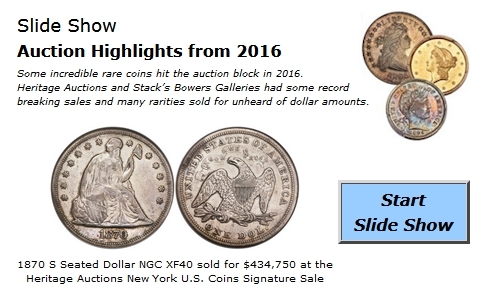 Clearly the trend for this coin was headed up and the marketplace identified it as a great acquisition each time it was available. In February 2007, the FMV was listed at $877,500, and it remained there until July 2009 when it rose to $1,417,500 as a direct result of the Heritage sale earlier that year. It has remained at this level ever since. �����Twelve years have gone by since the 2002 sale of the 1856 O in MS63 and it is still the only one known to exist. In today�s market, this coin could fetch considerably more. There are only 22 coins certified in the XF40 to AU58 grades by PCGS and NGC combined. We graphed the path of the FMV of an 1856 O in AU50 from 2002 to today. �����With only 2,250 coins originally minted and an extremely low population up to AU58, this coin is one of the rarest of the Type I Twenty Dollar Liberty series. However, there are many other dates within the Type I series that are just as enticing to collectors. Below is a list of some of the more expensive rarities along with the original mintage, total population in all grades, and the highest grade certified for the date. �����Even though the 1850 O has a seemingly high mintage it deserves to be in this group because of its high fair market value. It is an easy seller any time one is available in XF up to Mint State. For most of these dates the highest graded coin has not traded in a long time. This can distort current prices somewhat; you just don�t know what someone will pay in a major auction for an extreme rarity, especially if there are more than two potential buyers. In the current market, there are many collectors who would want any or all of these highest graded coins from our list. Nonetheless, the collector who holds the highest grade for a date is usually in it for the long haul and only the expectation of an exceptional price will bring such a rarity out for sale. �����All of these coins have shown great progress over the last twelve years and, according to most experts in this series, the FMV�s should continue to rise. One of the most interesting dates to watch for is the 1866 S No Motto. The recently graded MS62 by PCGS, which came out of the Saddle Ridge Hoard, should make for a big change in the FMV once it actually trades. �����Another fascinating date is the 1860 O, with the lowest mintage from the group above, with only 6,600 coins. It is also the only coin with no Mint State coins certified by either service. The current FMV of $89,120 in AU58 indicates that this coin would attract a significant price in Mint State. Keep in mind that these are not the only Type I Twenties with potential; this series has an abundance of better dates that have a positive outlook. The lack of availability of nice coins will lead to even higher prices in the future.